Looking for moist and fluffy pancakes that also pack a bit of a veggie punch? Try Carrot Pancakes. Don’t be fooled by the name — these carrot pancakes have a sweetness to them that is reminiscent of carrot cake! What’s for breakfast today? Make-ahead breakfast ideas are a go-to time saver for me because — let’s face it — I am not a morning person and have to force myself to roll out of bed to make my kids breakfast. It’s not that I don’t love them, because I LOVE them, it’s just that I’m a night owl and I find it hard to go to bed at a decent time. Which makes getting up in the morning even harder. Carrots. While they might be a root vegetable that are typical of a late summer to early fall harvest, they also scream Spring. As in, bunnies munching on carrots and Easter bunnies. Yeah, I know — a tad bit stereotypical of a bunny chowing down on a carrot, but there you go. 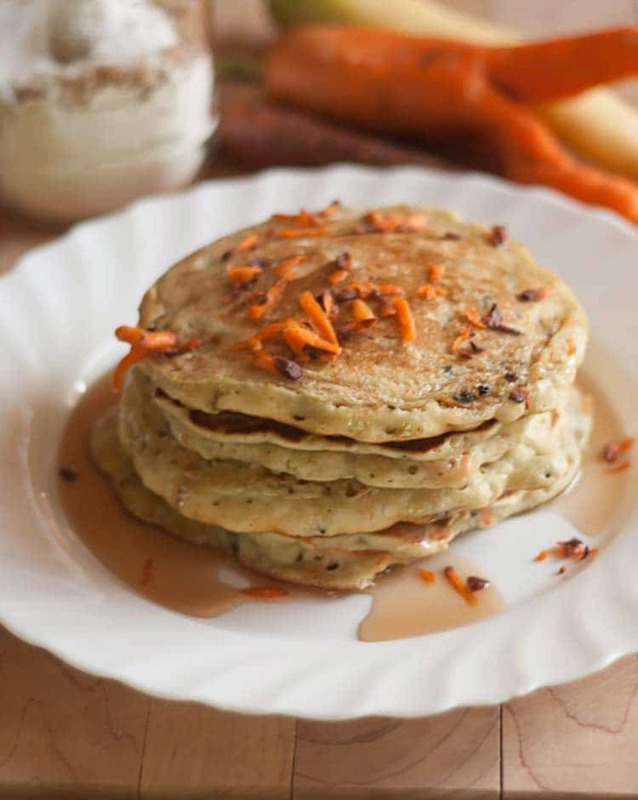 Get the full recipe for Carrot Pancakes below. 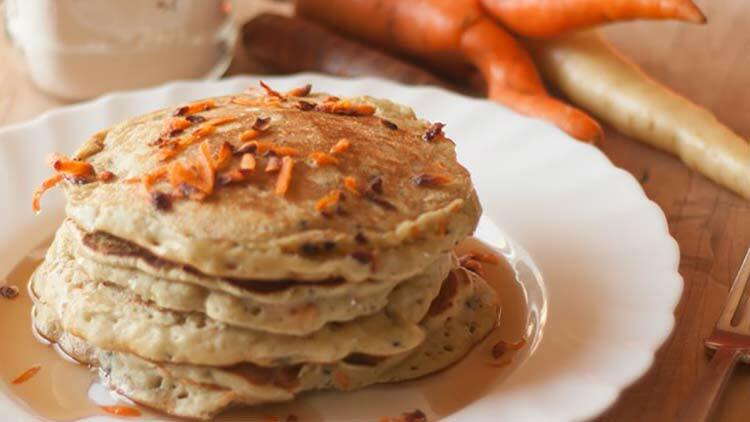 Carrot Pancakes — Great for Adults and Kids! I love taking food photos, in case you hadn’t noticed. There’s something about a photography subject that can’t talk back. As in, if my kids were in the picture, they might be asking why you can see gorgeous shreds of carrots. Only they probably wouldn’t be referring to a vegetable as gorgeous. Well — truth be told, these pancakes were made expressly by me for me. I mean, sometimes a woman’s got to serve herself up a golden superstar breakfast, right? However, if you’d like to make the carrots disappear inside the batter (like my children probably would), simple precook the carrots and mash or grate them finely. Notice the jar of dry ingredients in the photo below? I use this starter mix with a variety of pancakes. It is perfect for a mostly make-ahead breakfast… and is a great time saver. Carrot Pancakes take all of five minutes to throw together in the morning, and another few minutes if you didn’t already make up the make-ahead pancake mix. It’s just as fast as getting a box of pancake mix and throwing your wet ingredients together with it, except #1: you know where your ingredients came from and #2: no preservatives. I try to cook from scratch as often as possible while still counting on a quick, easy meal. And like I said before, breakfast is a rush at my house, so this no-hassle, throw-it-all-together-in-a-hurry breakfast works well for us. These pancakes can be easily modified! The 3/4 cup of mashed or grated carrots can be substituted with many things, including pumpkin, apples or applesauce, and bananas. My Carrot Pancake recipe is below. Look for this and other great recipes on All She Cooks Recipes board on Pinterest. 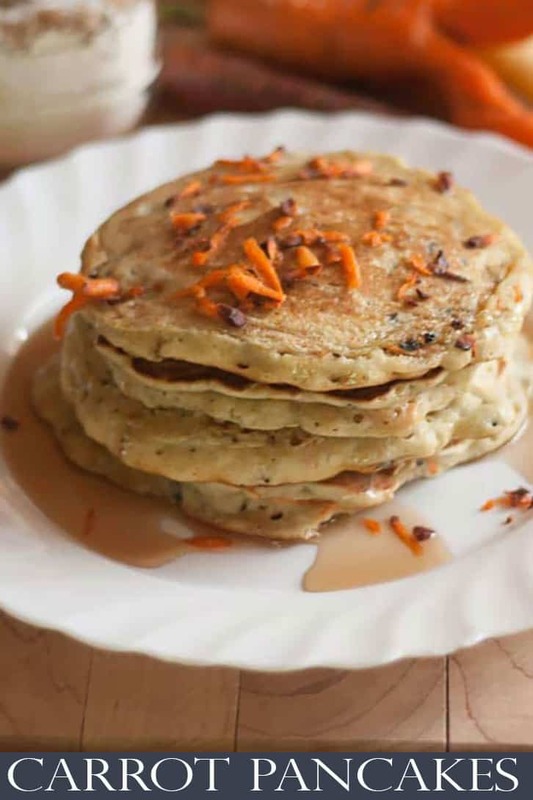 Carrot Pancakes are packed with flavor and taste a little like carrot cake! Pre-heat electric skillet to medium heat. Pour pancake bater onto skillet in 1/3 cup scoops. Cook for 1-2 minutes on each side, or until cooked through. I love pancakes! Thanks for the recipe! Stopping by from Treasure Box Tuesday! At first, I rejected this idea of carrot pancakes, but then I thought of how often I put grated carrots in my foods. Spaghetti sauce, meatloaf, etc. Haha The picture sells the idea though! I’m going to try it! I’ve made the banana version twice, since I keep remembering this recipe when I have bananas to use up. The last time I made them with some cinnamon, vanilla, and peanut butter chips – YUMMMMM! I look forward to trying other versions as well. That sounds amazing! Love the additions.